The Mercer Slough Environmental Education Center, located in a 320-acre wetland nature park in the heart of Bellevue, will celebrate its grand opening tomorrow from 10 a.m. to 5 p.m., with talks, tours, hikes, exhibits and activities. The 10,000-square-foot center will be the headquarters for Bellevue's Department of Parks and Community Services, and a learning space for the Pacific Science Center. The center has two classroom buildings, a multipurpose building, a visitor center and two wetlabs. 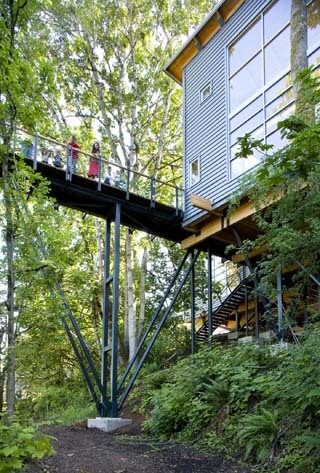 Buildings are elevated into the tree canopy, as much as 30 feet above ground. The center has been in the works for more than two decades. It was designed three times and on three different sites to meet transportation, access and programming needs. Jones & Jones Architects and Landscape Architects designed the project. The general contractor was Berschauer Phillips Construction. Lund + Everton Structural Engineering was structural engineer. The project was built to LEED silver standards. If certified, will be one of the first LEED projects in Bellevue. Mercer Slough Nature Park is at 1625 118th Ave. S.E.